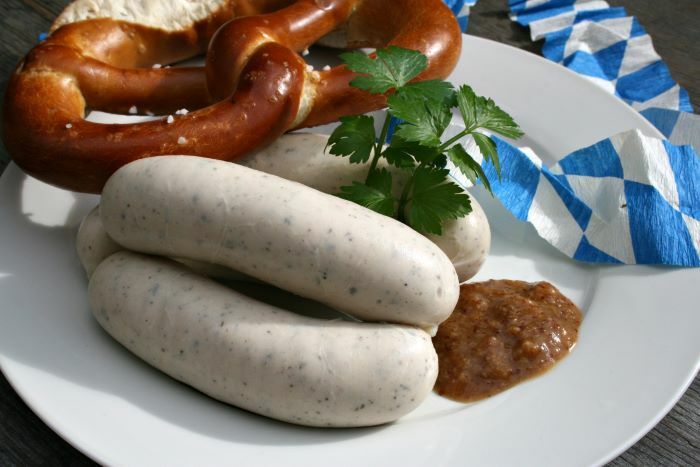 Almost unbelievable, that the development of the Munich „Weißwurst“ (white sausage) was more of an accident than intention. What happened? On a „Rosenmontag“ (carnival Monday) in the year 1857 the councilmen enjoyed their usual morning pint in the restaurant „Zum Ewigen Licht“. Hunger was mighty and the beloved Munich city sausages soon ran out. Getting replenishments was difficult, because the needed intestines were lacking. 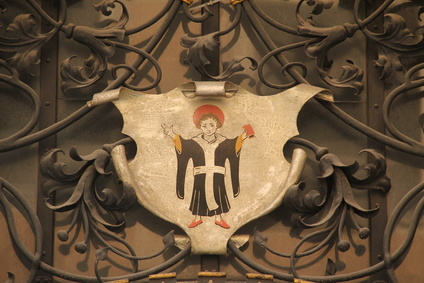 But as a smart Munich man landlord Josef had a clever idea. The prepared sausage meat was simply put into existing bratwurst intestines and boiled. Soon the thick sausages were put onto the table in big bowls filled with hot water. The councilmen tried them and sighed happily: „Ah Weißwürscht!“ („Oh, white sausages!“) and to this day the accidentally created sausages are known as „Weißwürste“. The success of this creation followed soon. The councilmen ate so many sausages, like never before in the restaurant „Zum Ewigen Licht“. Josef Moser over the time enhanced the recipe with lots of parsley, lemon zests and mace. 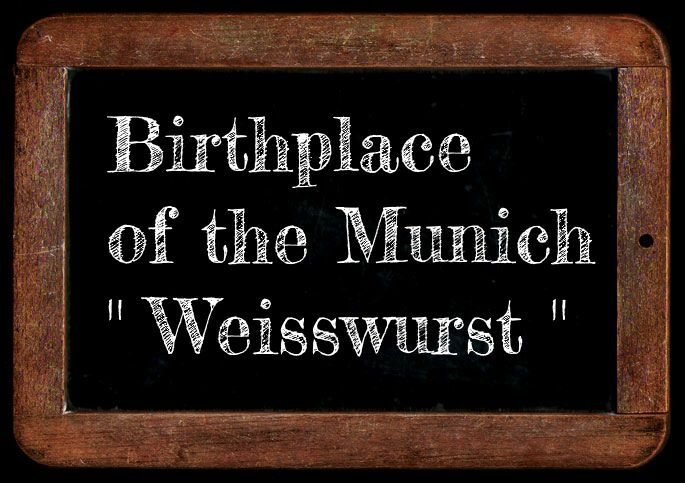 The Munich „Weißwurst“ got its unmistakable taste and conquered the world from this restaurant as a starting point. 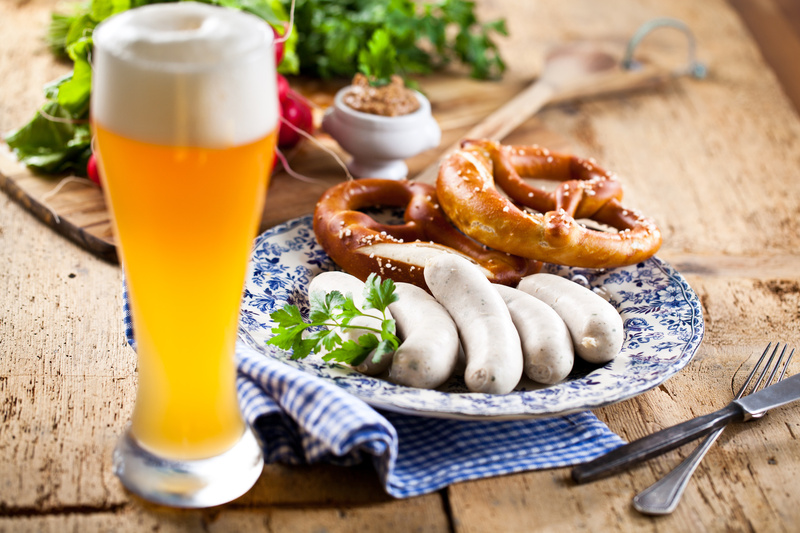 Over 150 years later it is an absolute speciality of Munich and is traditionally eaten with pretzels, sweet mustard and beer.